--Tuesday will be the biggest election since the hanging chads of 2000 when Republican candidate George W. Bush defeated the Democratic candidate Al Gore. Franklin County Debbie Door is predicting a 70 to 73 percent turnout in Franklin County. There are several items on this year’s ballot that could be over shadowed by the highly published race for the White House. Quick News has you covered so you know what will be on the ballot before you go vote. We want to make sure you see what the ballot looks like and wording used one the five different items voters will be asked to vote “yes” or “no” on. 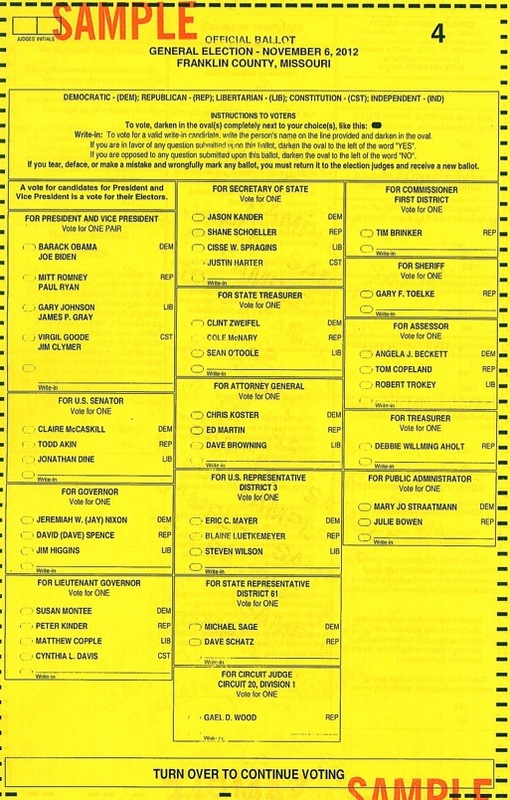 Click here to view the front of the ballot. 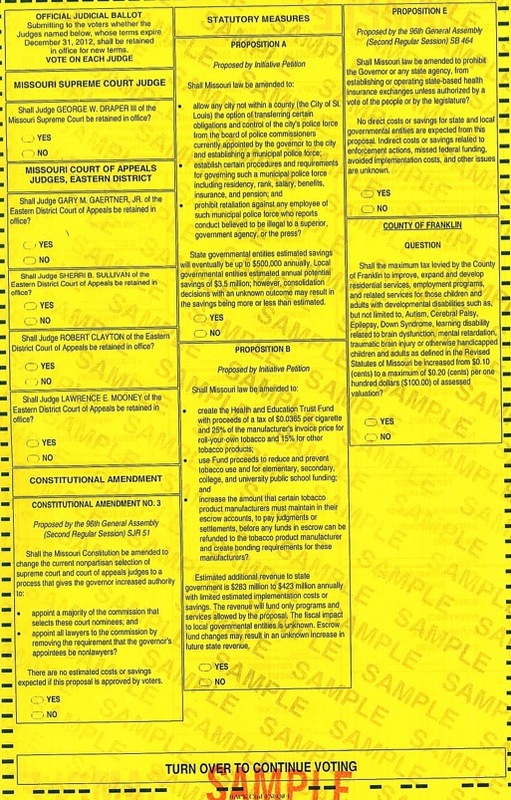 Click here to view the back of the ballot. Most voters are overwhelmed when they receive their ballot by the number of items to vote on. This year there are 18 elected positions to vote on, three propositions, (A, B, and E) one Constitutional Amendment, and one “Question” asking for the maximum tax levy in Franklin County be increased to 20 cents. Estimated additional revenue to state government is $283 million to $423 million annually with limited estimated implementation costs or savings. The revenue will fund only programs and services allowed by the proposal. The fiscal impact to local governmental entities is unknown. Escrow fund changes may result in unknown increase in future state revenue. be amended to prohibit the Governor or any state agency, from establishing or operating state-based health insurance exchanges unless authorized by a vote of the people or by the legislature? County of Franklin “Question” if voted “yes” would increase the maximum tax levy to increase 20 cents per $100 of assessed valuation. be increased from $0.10 (cents) to a maximum of $0.20 (cents) per one hundred dollars ($100.00) of assessed valuation?